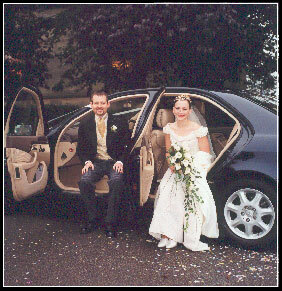 REGENCY CARS have been chauffeuring weddings for nearly 20 years! From the moment you step into one of our limousines, to the time we whisk you away to your hotel or off to the airport on your honeymoon! Over the years, we have had many letters of thanks from satisfied newly weds and their families! .....Once again, many thanks and I would not hesitate to recommend you to anybody. Just a quick note to thank you for your services on the 24th March. I will certainly not hesitate to recommend you! Roger & I would like to say a big 'Thank You' for arranging the cars for our wedding day. You worked hard on those ribbons and bows and they looked lovely! We felt like King & Queen after the wedding and the champagne was a lovely thought! Roger was very pleased when we went the long way round as he'd never been in a "Roller" before!! Thank you very much for helping to make my daughters wedding something special. Royalty couldn't have been treated better. Please thank your drivers for us? I will certainly recommend you to anyone wanting cars. I feel I have to write to express my sincere thanks for an outstanding service provided by your company at my daughters wedding on Saturday. On behalf of my wife and myself, I would like to express our sincere thanks to the two gentlemen who drove the cars for our daughters wedding on Sept 21st and made it such a special occasion for us all. Thank you again, we really did appreciate it! We were very pleased with the standard of service and it all helped to make our special day go without a hitch.